Happy New Year to you and your familias near and far. In this new year’s celebration, I ask that you keep the advancement of the Friends of the Mariana Trench Monument goals foremost in your new year’s resolutions and goals. Jan. 6, 2018, marked the 9th anniversary of the declaration of the Mariana Trench Marine National Monument. For nine long years, you have stuck with me through the waiting and I am so very grateful for your support. Your support provides me with the inspiration to keep pushing forward. In the spirit of our anniversary, below I offer you the timeline of outcomes and hurdles crossed. I apologize in advance because it is so long. I hope that you read it to the end. During this time, many of you have signed petitions, written letters, shared things on Facebook, or maybe you just stayed engaged and followed along with developments. It continues to fall on us to pursue the FOMTM 2008 vision statement, which included specific cultural connections to the Marianas Trench Marine National Monument. These areas of consideration included: 1) management and enforcement, 2) culture and tradition, 3) conservation, 4) education, 5) research, and 6) economic development. We must continue to support our delegate’s office and the governor in pursuing those things promised us almost 10 years ago now. Through your continued support and participation with the Friends, I believe that we can do this together. 2009: This was the year the monument was declared. Immediately it was evident that the monument we asked for was not the monument we received. Our community asked for a large, highly protected monument managed by the Office of National Marine Sanctuaries of the National Oceanic and Atmospheric Administration. We were given a smaller monument, with fewer protections, managed by U.S. Fish & Wildlife. 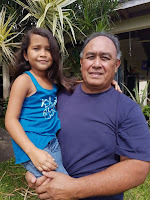 Several of us wrote to Kilili and requested that he transfer monument responsibilities to the National Marine Sanctuaries; to protect the marine ecosystems above the Mariana Trench, not just the rocks at the bottom; and to urge follow through on submerged lands transfer. Delegate Kilili also achieved one of his first legislative victories and the CNMI Department of Lands and Natural Resources received a $220,000 earmark for educational programs on marine sanctuaries. 2010: With little progress in developing the monument management plan coming from the federal government, we again made requests for the sanctuary process. We separately asked for Kilili’s earmark to be used to develop and design a visitor’s center “…resulting in a workable, concrete architectural plan and plans for hands-on exhibits, an aquarium, areas for scientific presentations, and other community interaction.” Our sanctuary request was denied a second time, and rather than begin a sanctuary process, the head of NOAA directed the NOAA Pacific Islands Regional office to explore ways to better develop a partnership with the CNMI government. Sadly, nothing came of this. 2011: The management plan was due on Jan. 6, 2011, according to the language in the monument declaration; however, U.S. Fish & Wildlife only published their first planning update on developing a management plan. For us, they appeared like students trying to submit their “planning update” on the day their semester project was due. We participated and helped, but were frustrated. Two years after the earmark was received, DLNR put out a request-for-proposal for visitor center design planning. I mention this so that we do not put all the blame on the federal government. Our local government has also dragged its feet. There are now NOAA and U.S. Fish & Wildlife staff being paid to work on the monument (and have been for some time), but they all live in Hawaii, not the Marianas. 2012: U.S. Fish & Wildlife published its second management planning update with announcements for scoping meetings. There was still no management plan at the end of the fourth year. 2013: U.S. Fish & Wildlife published its third management planning update with public comments, questions and their responses. Herman B. Cabrera and Associates completed a report on a visitor’s center, identifying costs to rehabilitate the Navy Hill Lighthouse and recommended other locations for consideration. The plan went on a shelf and was never shared with the public (including up until the writing of this letter). Tens of thousands of dollars from the earmark were returned to the federal government unspent. Infighting between NOAA Fisheries and U.S. Fish & Wildlife staff seem to have held up publication of the management plan. Increasingly frustrated, Kilili wrote to NOAA to request that NOAA Sanctuaries take over management of the monument. That request was denied (the third denial from the federal government to start a sanctuary process). Kilili finally got a win for the CNMI when then Secretary Jewell signed the submerged lands patent, making it the first promise kept from the monument declaration’s list of promises made by the federal government. 2014: Three years after it was supposed to be finished, U.S. Fish & Wildlife published its fourth management planning update, which included a schedule for a visitor’s center working group public listening session. This didn’t really go anywhere that we know about. 2015: We’ve nearly given up. Another year of no progress. Despite this, Kilili uncovered that NOAA spends $3 million per year on Pacific monuments. None of this money is making its way to our community. 2016: Seven years after the declaration, and frustrated beyond belief, Delegate Kilili and Gov. Torres jointly asked President Obama to begin the sanctuary process. NOAA Fisheries, led by Mike Tosatto in Hawaii, worked to block our local government officials’ request. No additional information on the management plan came out from U.S. Fish & Wildlife. It finally hired a monument manager based out of Guam. At the end of the year, the White House told Kilili to submit a sanctuary proposal and they will consider it. We helped submit a proposal in December. This was when the CNMI and the federal government both signed a patent conveying submerged lands around the Islands Unit of the monument. 2017: Over eight years, the Obama Administration ignored four requests from our community and our local government officials to begin the sanctuary process and failed to publish a monument management plan. Right up to the very last day we hoped that they would take some action. They did not. But in March 2017, the Sanctuary nomination was accepted to the National Marine Sanctuaries’ inventory list. The next month, the Trump administration announced they were conducting a review of all large monuments declared in the last 20 years. We joined with Friends of Refuges groups nationwide in support of maintaining and bettering monuments. The above is mostly a review of the progress of the management of the monument, or to be honest, the lack thereof. There have been other developments that have been very positive. James Cameron became only the third person ever to dive to the bottom of the Mariana Trench in 2012. And the level of research and discovery taking place in the trench these last few years has been unprecedented. Vessels from China, Japan, and the United States have had amazing new discoveries that are changing the way we understand our world. Despite our frustrations with the monument, our community continues to want more ocean protections, not less. There have been numerous studies over the last 10 years that have taken place in our community showing that our people would like to see more marine protected areas—this despite our frustrations with the largest marine protected area in our islands. We have worked hard to tell our story to the world. We worked with the NOAA Fisheries office to present an iPoster presentation on the monument at the 2016 IUCN World Congress in Hawaii (The International Union for Conservation of Nature). And I attended the Our Ocean conference in Washington, D.C., representing our community. Globally we are receiving recognition for our natural wonders. Late last year the federal government successfully submitted their World Heritage site application for the Mariana Trench. The nomination was largely written by the late Richard Seman. Nine years seems like a really long time and in some ways, it is. As processes like these go, maybe this was to be expected. However, the management plan is the keystone to any possible progress that we can hope for and it is long overdue to the people of the CNMI. Even now, six years after its due date, we are still waiting and it’s always one thing or another; and we are told to be patient, that it is coming. I think we’ve been patient long enough. The U.S. Fish & Wildlife should publish the management plan so that we can all move on to next steps. In all this time, the most frustrating part is that in the original FOMTM 2008 vision, National Marine Sanctuaries was ready to be our federal partner. If the Sanctuaries relationship had been established when the declaration was made, we would have had our visitor’s center and so much more within the first three years of the monument. Instead, here we are. But even starting the sanctuary process now might be faster than waiting for the U.S. Fish & Wildlife to publish the management plan at this point. This is an easy remedy. Together, we must keep fighting for our vision. We must remain alert to make sure that we see a management plan and provide support for our sanctuary nomination to move forward. I continue to remain in close contact with Delegate Kilili’s office and support Gov.r Torres in making forward progress with both of these items. I look forward to you and your familias’ continued support. If you have any interest in becoming more directly involved, please contact me at marianamonument@gmail.com. Feliz año nuebo and God bless.